Located atop the preeminent SunTrust Plaza building in the heart of downtown Atlanta, Dentons’ Atlanta office reflects the energy of a city that has emerged as a premier global business center and the world headquarters for 18 Fortune 500 companies. 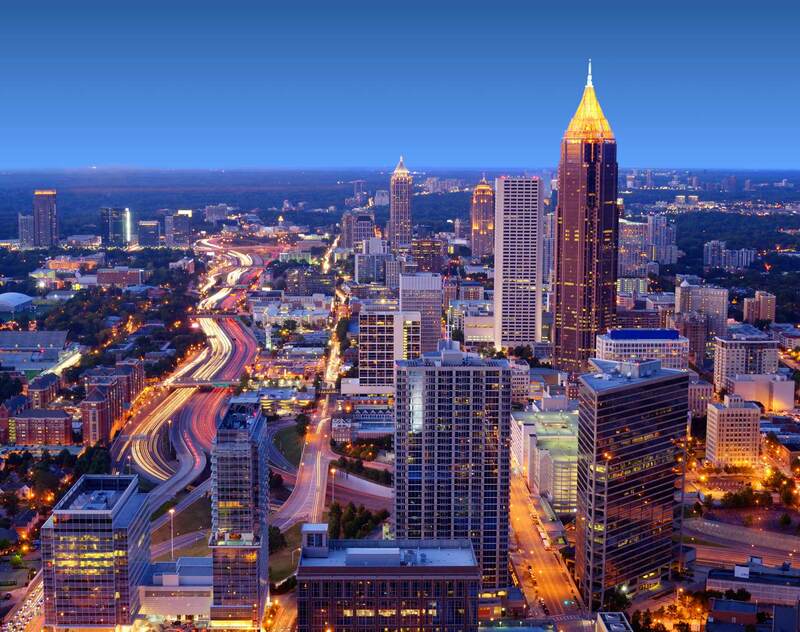 Our team in Atlanta offers a full range of legal services in a multitude of sectors. We represent corporate entities from their startup phase through their initial public offering or acquisition, providing sophisticated guidance on a wide variety of corporate and transactional matters. These range from the financing and structuring of public and private deals (including related tax consideration and planning) to general corporate counseling and governance—all while maintaining an open, active dialogue with you. Over the years, the Atlanta office has developed one of the leading private equity practices in the Southeast, representing a broad array of funds engaged across a wide range of sectors. Take advantage of our intimate knowledge of the hotel and leisure industry. Our ability to think and act innovatively can help you strategically address today’s challenges and opportunities. Because we represent both owners and operators of hotels, we analyze problems from all perspectives and find practical solutions to the issues you face when acquiring, disposing or financing hotels and in negotiating long-term agreements for your management and branding. Atlanta’s Litigation and Dispute Resolution group is broad and diverse and covers all areas of dispute resolution. Whether your need involves commercial litigation, class actions, financial institutions, insurance, bankruptcy, environmental, intellectual property, labor and employment or almost any other type of litigation, Dentons’ world renowned litigators are here to serve you. With your best interests as our top priority, our lawyers begin every case with a careful assessment of your goals. From there, we formulate a strategy tailored to your business that will achieve those goals. Dentons’ top-ranking, politically diverse Public Policy and Regulation practitioners work with federal, state and municipal government agencies across the country to provide you with strategic counsel and support to expand government markets and shape public policy. Moreover, Dentons’ Real Estate team offers you a multidisciplinary experience that spans the spectrum of real estate development, investment and finance, taking a sensible, business-oriented approach to the handling of your matters. Well aware that conducting business today requires a critical evaluation of potential risks, responsibilities and rewards, our lawyers focus on practical and innovative solutions to complex problems that arise in real estate transactions. Dentons’ Public Finance practice serves local, state, regional and national clients in all areas of public finance. Lawyers in Dentons’ Public Finance practice serve as bond counsel, special tax counsel and disclosure counsel for states, cities, counties, school districts, public authorities and other governmental entities, and as counsel to underwriters and institutional investors involved in these financings. Finally, if the need arises, our nationally known Restructuring, Insolvency and Bankruptcy team can assist in all aspects of bankruptcy and insolvency matters including creditor, debtor, committee and buyer rights, as well as representing court appointed fiduciaries. No matter what business you are in, the lawyers and professionals in Atlanta will work side by side with you to ensure that you meet your business goals and continue to lead in your industry. In recent weeks, the Georgia Government Transparency and Campaign Finance Commission (Commission) has undertaken a pair of important actions that indicate the agency's desire to play a more expansive regulatory role on campaign finance and ethics matters heading into the 2018 election cycle. The legal profession's system of self-governance relies in part on what is effectively an "honor code" for attorneys. Specifically, when an attorney becomes aware of misconduct by another attorney, many states require that the attorney report the violation to the applicable bar authority and even discipline attorneys for their failure to report. The Georgia General Assembly adjourned for the year in the early morning hours of Friday, sending to Governor Nathan Deal a major slate of bills. The Dentons' Georgia Government Affairs team breaks down the bills that passed and those that must wait until next year. Dentons, the world’s largest law firm, today announced that principal Eric Tanenblatt has joined the board of directors of Points of Light, which provides expertise to the organization’s mission in inspiring and mobilizing change throughout the world.